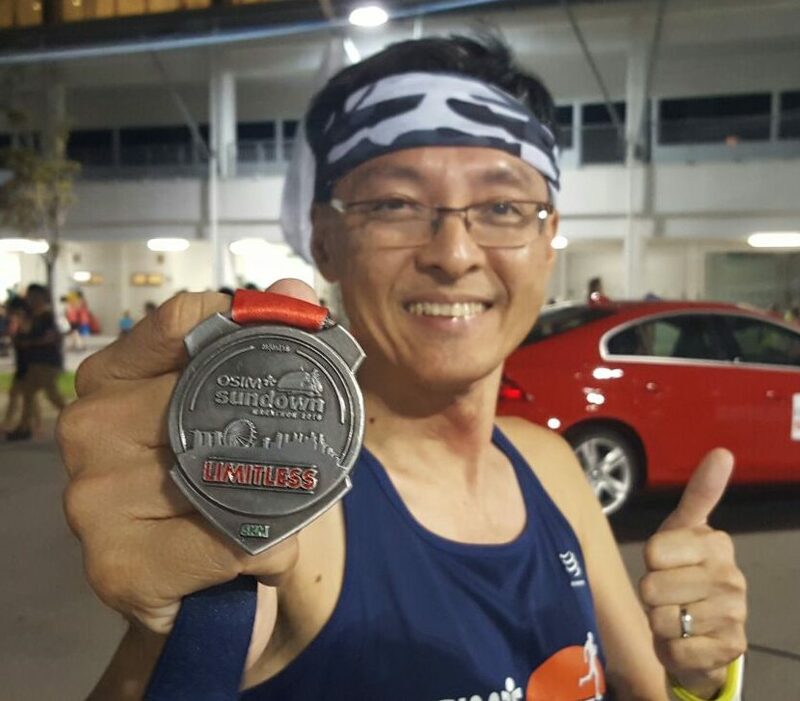 Race Review: OSIM Sundown Marathon 2016 [5KM] (by SY) | JustRunLah! 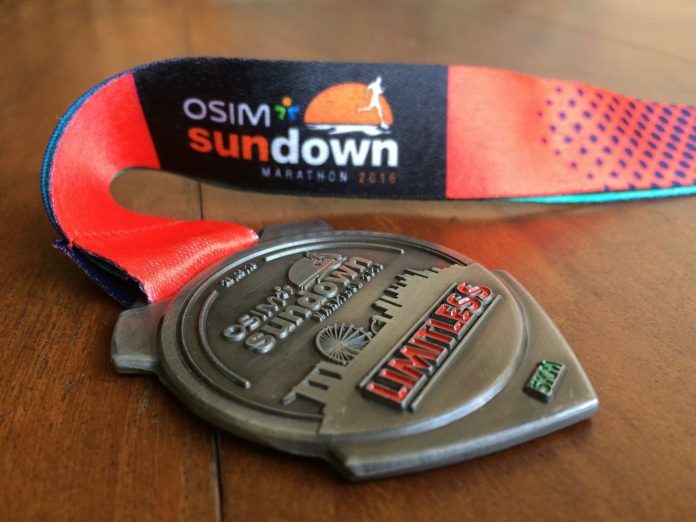 The theme for this year’s OSIM Sundown Marathon sounds inviting – LIMITLESS. There are two ways to look at this. If you are a non-runner, the future is limitless once you take the first step to run your first race. For the seasoned or elite runner, there are the ultra, SEA Games, Olympics or Boston or Chicago Marathons lying in wait. What about the those who injured themselves and faced an uncertain future of running. Will LIMITLESS apply to them? Read on to find out more. For those who are runners, you will agree with me that running is akin to life. The emotions and experiences that you get from running, you also get in life. There are many firsts in running; first race, first medal, first finisher tee, first PB, first FM, including first injury. After almost two years of running, I encountered my first injury. However, this post is mainly to review the OSIM Sundown Marathon 5km fun run more than to tell you about my injury. The decision to do this race was conceived more than two months ago when my son, Austin and I talked about a night run. We were toying between 5km or 10km because at that time the HM or FM were out of my contention. We landed on the 5km for a few reasons; less cost, early start (no need to rush with the other runners) and can get home by midnight. 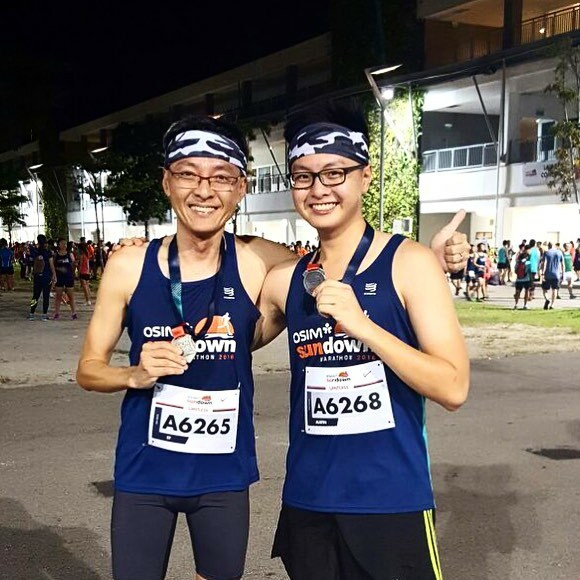 We also just wanted to enjoy a cool, night run as father and son. REPC was scheduled on the weekend of 20-22 May at Suntec Convention Centre. We arrived at about 11.30am on Saturday morning and were pleasantly surprised that there was no queue at all categories. We whisked through the collection counter quickly. I must say that the organisers had the whole REPC experience well thought out. The runners were enticed with running merchandise that tempted many to part with some cash and bring home more goodies than just the race pack goodie bag. We had to snake through all the sponsors and other commercial booths hawking their wares to the runners. As we walked through the ‘maze’, we felt like some ‘IT or PC show’ where there were more salesmen or promoters than runners. I suppose we were early hence the crowd had not swelled up yet. Discounts were aplenty and many varieties of sports wear, gears and accessories to choose from. We walked past #justrunlah booth and saw Yvonne peeping from behind the backdrop; don’t know if she was too shy to come out. Wanted to take some photos with her and July (the new JRL and Mizuno ambassador) but no chance. Better luck next time. Right at the end of the maze, we picked up a free bandana each. Ain’t it cool?! We both realised that a night race gave us the time to have a proper meal before the start of the race, albeit early dinner for us. After a quick home-prepared meal, we trained down to Promenade, the nearest MRT station to the F1 Pit where the race village is. On the way, we only saw a few runners until we reach our intended station. 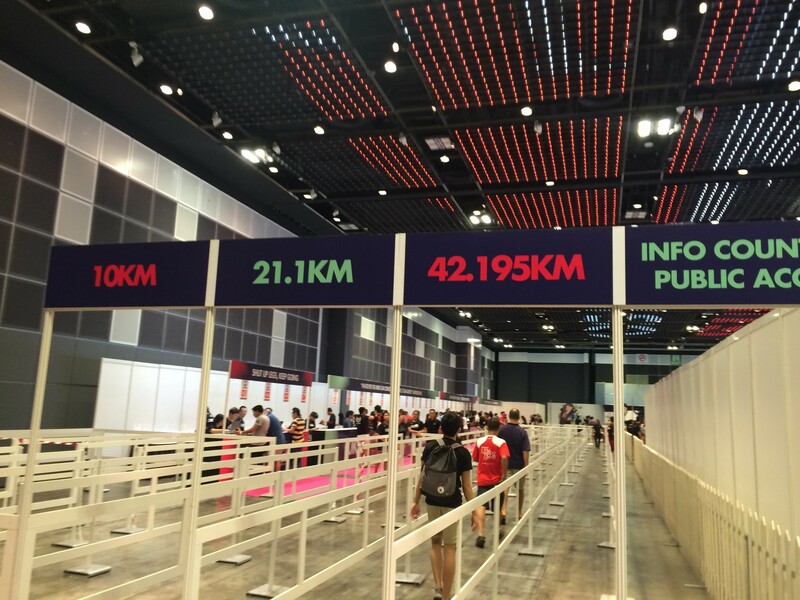 Runners from all Singapore began to converge at Promenade station and make their way to the starting pen. We arrived very early and took some photos before the skies got too dark for a decent photo. It was only a 5km run so we didn’t bother to do too much warm-up. Once the start pen opened at 7.45pm, all the eager runners started to surge forward. It was the first time I saw some many runners of different ages, sizes and heights. I spotted this angmoh who must be close to 1.9m tall; it would probably be a 2.5km run for him since his stride was going to be twice as much haha.) They were also many children of all ages at the starting line up together with the adults. Although the kids were accompanied by adults, I thought it would be safer for them to have a different timing or path as some runners (although it was a fun run) really dashed ahead at the start; causing them to avoid the kids precariously. So we were off at precisely at 8pm. I told my son to go ahead and get a good timing (no timing device were given for 5km runners meh) while I took my own time to enjoy the run. I was still nursing my knee injury and decided to take it slow even at the start. The initial 500m stretch was pretty narrow and there was overcrowding as most were not very fast runners. So even at my low pace, I was somewhat impeded by the human traffic. Runners started to space out at the 1km mark and I still had not felt any pain on my knee. Good sign, I thought to myself. So up the helix bridge I went, at a tortoise pace of 8-9min/km and just taking in the Marina Bay night scene. As I closed in to the 2km mark, I felt the ominous pain on my right knee returning. I trudged on. I slowed to almost a brisk walk at about 2.5km mark and could jog no more. The hydration at mid point helped to perk up my mood a bit. My son passed me on the return lane and waved at me. I returned with a weak smile; as I was already in pain. Half limping, half walking, I made my way towards the U-turn. Many runners, male and female, even kids, whisked past me. For the first time in many races, I felt that I may ended up as the last runner. Feelings of sadness and self-pity threatened to well up in me but I fought back. I am a runner; I am in a LIMITLESS race; I cannot give up. So after walking for 1km, I started to walk/jog from the 3.5km mark onwards. Gardens by the Bay was on my left, and the Bay was on my right. The night lights from the Singapore skyline seemed to be egging me on; but my knee just won’t listen – a case of the spirit is willing but the flesh is weak. At the 4km, I decided that I will brisk walk at a faster pace. I tried to activate my glutes and hamstrings more to assist in my strides so that I didn’t stress my knee too much. As I made my way up the Esplanade Bridge; I felt the need to finish strong at the last 500m stretch. As I turned into last stretch, I could still feel the pain gnawing at my knee. Having trained myself to ignore pain (yes, I do listen to my body most of the time), I picked up my stride and pushed myself into a sprinting mode. As I raced past the finishing arch as the cameras flashed away, I heaved a sigh of relief. I did not even bother to post for the photographers. I did it. I finished my first race; still nursing an injury. I checked my GPS watch – 45 mins. It’s a far cry from my sub30 for 5km. I had planned to run 35-40mins but it turned out to be more than I expected. But I was still thankful that I made it. I picked up my banana, a 100Plus and the pretty finisher medal. After cooling down and having done some stretching, I went looking for my son; which I later found out that he finished in under 30mins. He told me that it could have been faster if not for the bottlenecks at the starting point. There were plenty of booths for runners to browse after the race. The massage booths were still not open; only for the HM and FM runners. Music continued to blast to maintain a carnival atmosphere within the race village. I was sure many would stay to party and the after race events will be a draw for the longer distance runners. For me, I rather go home and sleep. So, we took the usual post run photo and then made our way home; me still spotting a slight, painful limp. As we walked to Promenade, we saw a huge group of runners, presumably the 10km contenders, spilling out from the station. I was sure that there were some who were doing the 21km or Full Marathon among them. On one hand, I wished I could join their ranks to run from Saturday to Sunday; on the other hand, I was happy that I was done with the run and going home for my much needed sleep. As I sat in the train, I reflected on my running journey thus far. Although I had come a long way from my first race in 2014, I did not imagine that I would sustain my first injury that would ground me for a while. There was much more that I wanted to do as I eased towards the next decade of my life. Would I be able to run a full marathon, or let alone get back to 10km or HM – that is still a big question. Having covered a total distance of more than 2000km so far in two years, I realise that running comes with many surprises; pleasant and nasty ones. 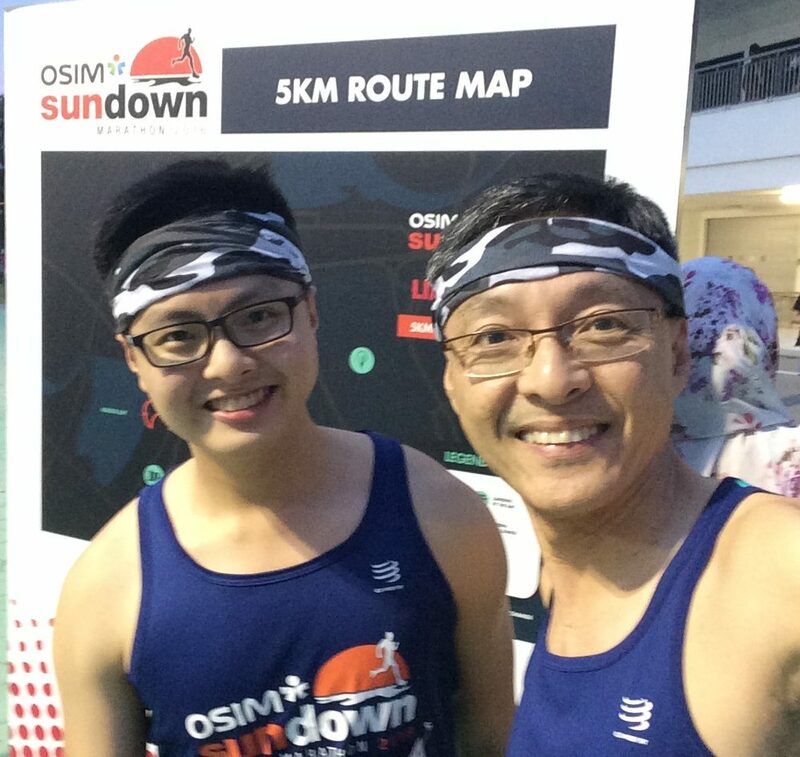 OSIM Sundown Marathon 2016 has afforded me an opportunity to do a night run. Thanks also to my friend Kenjoe; for giving a free slot for this run. For all these I am grateful and feel thoroughly blessed. To be able to bond with my son over a run like this is indeed another blessing. He told me that when I recover, we should go for 10km races. Brilliant idea; I would love to do that with him. As for the knee injury, although it is a setback, I consider it as a valuable experience to teach me to run better in the future. Till then, it’s downtime for me. I shall return stronger. I can still be LIMITLESS!